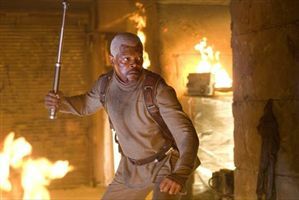 Cast: Hayden Christensen, Samuel L Jackson, Rachel Bilson, Jamie Bell, Diane Lane. Jumper looked like it was going to be fun. Teleportation, a big special effects budget, Samuel L Jackson with silly hair - how could it go wrong? How indeed. Well, firstly, the story's a bit wanky. We like the way Hayden Christensen discovers his innate teleporting ability and we like the way he uses it. We also like the subtle implication that he's only interested in looking out for number one, which is a brave and welcome deviation from the norm. We don't like however, the mass of detail that's been left out. We don't see him grapple with the learning process of using such an immense and unguided talent, we don't see how he has to hide his talent for fear of being exploited, and we don't see him playing with the huge array of opportunities he's been exposed to, and their unforeseen consequences. The movie's less than an hour and a half, there's enough leeway to watch him getting it wrong a few more times. Moreover, we're never told how the teleporty thing really works - we wonder how he can take stuff with him through the jumps, and how he determines how big the jumpy hole thing gets. We question why sometimes, and only sometimes, a jump makes a big dent in the ground, and why he seems to need "jump sites" rather than being able to hop about anywhere. Then when the bad guys start showing up, the absence of guns seems a little strange. Now as it turns out, nearly all of these questions have in fact been answered already in the author's head, but you need to go away and research them to find the answers. Who's going to do that (except a reviewer with too much time on his hands)? Giving us the answers in the movie would've made the story a whole lot more coherent and believable. It looks for all the world like they couldn't be arsed with the details - and that's not something I ever thought I'd be saying about a Doug Liman movie (the man responsible for The Bourne Identity). The second problem is Hayden Christensen. I enjoyed his turn as young Darth, but he just doesn't sparkle here, which is a problem when his co-stars Samuel L Jackson, Rachel Bilson (from The OC) and Jamie Bell (Billy Elliott) are all so good. Apart from Bell's insistence on speeding through the unfamiliar word "paladin" - he'd charged through it three times before I finally twigged what he was saying - he's the most watchable, and the special effects are pleasingly thrilling. Once again though, it's tainted by the popular dumbass trick of showing the best and most surprising moments on the trailer. Please stop doing that. Jumper is good clean fun, with effective use of visuals and some excellent supporting performances. Pity the story is so weak, but I suppose you can't have everything. Testosterone Satisfaction Rating: 3/5 - nothing naughty, some violence and one F word. To enjoy this film you should: enjoy the ride. Jumper was released in the UK on 14th February 2008.